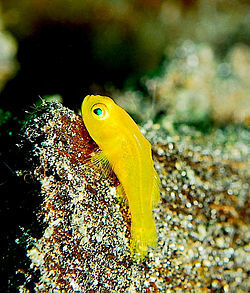 A small goby that will usually sit on SPS corals and doesn’t move. They will lay eggs on the underside of SPS corals which can hurt the coral. They also are know to take bites out of the SPS so you need to take care when putting one in your tank. They need to be kept with peaceful fish. They sometimes will fight among themselves but generally you can keep more than one per tank, unless the tank is small.